The North End of Ocean City New Jersey is from the Gardens area to 6th Street near the Ocean City high school. The Northend is made up of a combination of duplex condos, multi-family rental homes close to the beach and boardwalk and single-family homes. There is also a mixture of primary resident homes and those used as vacation rentals for the summer. The Northend of Ocean City is fund area to live or visit. It is very easy to get around on foot or by bike. Real estate in the North End of Ocean City starts around $200,000 for smaller condos and tops off with multimillion dollar single-family homes. Are you looking for northend homes for sale in Ocean City NJ? Then click on the map above to view all northend homes. 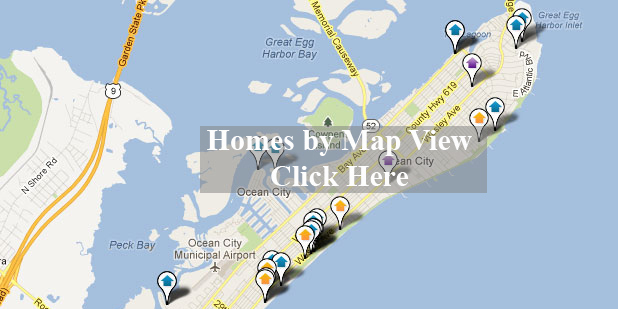 Northend homes for sale in Ocean City is our specialty. Above are just a few of the newest homes to hit the market. Our website provides you the ability to view all active listings in Ocean City, Strathmere, Sea Isle City, Avalon, Stone Harbor, Wildwood, and Cape May. The site is easy to use for all your property search needs. Featuring the best foreclosures, bank owned homes, land, and homes for sale at the Jersey Shore. Contact us! Sign up to the right to receive free daily email alerts as they hit the market.